Here is a warm one dish meal that is a perfect cold weather fit. Pictured above is the inside of the dish, before the mashed potato topping is added and before final baking. 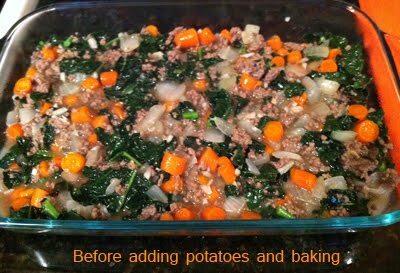 You can see this is a wonderful method of adding kale and colorful vegetables to your dinner. 1 batch prepared mashed potatoes (I boil potatoes, then mash with additional chicken stock, earth balance to taste. Salt and pepper to taste). Prepare potatoes and set aside. For base of pie, saute diced onion until translucent. Brown the pasture raised hamburger. Add carrots, celery, kale, herbs and seasoning. Add 1/2 cup of chicken stock and 1 tablespoon of tapioca starch. If you prefer more of a gravy base, instead use 1 cup of chicken stock and the 1 tablespoon corn starch mixed with 1 tablespoon cold water. Stir into pan over medium heat until kale begins to soften and turn rich green. Mix all ingredients, except potatoes, together and pour into a baking pan. Top the base with prepared mashed potatoes. Variations: consider using sweet potatoes or a blend of cauliflower and sweet potatoes. Bake at 350 degrees for 30 minutes. Broil for 2-5 minutes, or until top is golden.